In the 1700's, while the glory of Venice was to the apex of its splendor but to the beginning of its express decline, Carlo Goldoni anticipated the french revolution renewing the european theatre: it removed to the actors the mask of the comedies of the art in order to show the true face and the emotions of the bourgeois of the age of the illuminism. 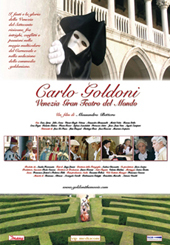 In this every film-documentary reference to facts or real persons is not at all accidental, indeed: happened of Carlo Goldoni work is just to a skillful drama organization of its real life. Goldoni door in scene the true protagonists of its private universe in order to exalt its passions: love, food and gambling, ironic, backs of the fate and its enemies. An art that, in virtue of its famous reform of the theatre and the comedy, will touch unsurpassable summits and will carry the world wide reputation.